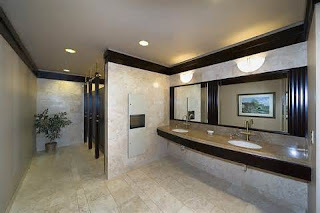 When people think about the dirtiest place in a commercial bathroom, they first think about underneath the toilet seat. While it is true that the toilet seat is a place where germs collect, many are surprised to learn that the scariest place in the bathroom might be just underneath the mirror. This is because faucets and counter tops are places where germs collect when people wash their hands. Germs may be present on the toilet seat, but if a person sits on a toilet seat and their skin is not compromised by a cut or by a bruise, it is very unlikely that the germs will be able to gain entry into the body. On the other hand, areas that people constantly touch in a bathroom, such as handles, light switches, and knobs, make it easy for germs to pass from a person’s hands into their body when they rub their eyes, scratch their nose, or when they touch their mouth. In order to minimize the chance of people being contaminated by harmful bacteria, high touch surfaces in a commercial bathroom should be cleaned multiple times during the day and should especially be cleaned when they are visibly soiled. those that contain strong chemicals. In most cases, a bathroom can be thoroughly cleaned using natural products. There are some instances when products that have diluted bleach or other chemicals will provide a higher level of germ protection. It is good for people who have the responsibility of cleaning commercial bathrooms to check the product labels on the cleaning solutions they are going to use. They should find out what germs and what types of bacteria the cleaning solutions they are using are designed to kill. They should make sure that they are using products that are adequate for the environment they are working in. Of course, there is never going to be a completely germ free commercial bathroom. The high level of traffic that the bathrooms experience mean that from time to time germs and bacteria will accumulate. However, people who use commercial bathrooms can protect themselves by making sure that they thoroughly wash their hands after using the restroom facilities and before they touch any part of their face. By taking this simple step, a person using a commercial bathroom can protect themselves from germ contamination. You know, I never thought that under the sink would contain more germs than under a toilet seat - thanks for the share.